As most of you know I had a baby (well actually my wife physically had the baby) about a year ago. I have previously covered an interesting program called babySmash Let the Little Ones Enjoy your Computer. BabySmash Time! Let the Little Ones Enjoy your Computer. BabySmash Time! Read More that lets your little one mash your keyboard and get some sounds and characters. My little Kayla loved it and now I have come across another similar app and thought we would share it with you. I downloaded the tiny 481KB ToddlerKeys executable from here. The next screen allows you to automatically start the app with Windows as well as whether or not to create the shortcut and launch ToddlerKeys immediately after installation. This is a free program so it does not come with sounds or images, so at first I was like….this blows! Then I thought about how I secretly wished I could change the sounds and icons from BabySmash. 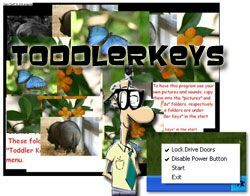 Now with ToddlerKeys I can customize what my baby is seeing and hearing. The letter K brings up a picture of my daughter and says the words that she says. On this screen you can choose what drives will be locked when ToddlerKeys is running as well as a few other basic options. You can also customize the word you need to type to exit. It is set at quit by default. Do you let your little ones use your computer? Now with my baby teething I am sure glad my HP Tablet is water resistant! But if yours is not, you can always add a piece of Clear Plastic Wrap over the keyboard tucking it under so drool doesn’t get where it doesn’t belong! I just installed it and my 11 month old daughter had so much fun smashing the keyboard and seeing her pictures. She was all giggles. I am so glad she liked it! Do you have any other favorite Baby apps you would like to share with us? Recently, I've been looking into the multitude of digital devices and gadgets on the market that target our youngest children. My interest is to better understand how the "digital bombardment" (Ian Jukes) our youngest are experiencing is impacting their brains and processing capabilities. I've learned that the early and frequent experiences with technology are enhancing our childrens' visual memory and visual processing skills. Have you read about the Human Brain Project or looked into Brainbow imaging? Check it out. In a nutshell, it concludes that our children are processing the information we process quite differently than we do. It is fascinating work. You will thoroughly enjoy! Toddler keys will be more than useful when kids around ur computer,pressing unwanted keystrokes from kids may corrupt your computer.